How far a wonderful and mysterious agency of God’s Spirit may so influence some men’s hearts, that their practice in this regard may be contrary to their own principles, so that they shall not trust in their own righteousness, though they profess that men are justified by their own righteousness — or how far they may believe the doctrine of justification by men’s own righteousness in general, and yet not believe it in a particular application of it to themselves — or how far that error which they may have been led into by education, or cunning sophistry of others, may yet be indeed contrary to the prevailing disposition of their hearts, and contrary to their practice — or how far some may seem to maintain a doctrine contrary to this gospel doctrine of justification, that really do not, but only express themselves differently from others, or seem to oppose it through their misunderstanding of our expressions, or we of theirs, when indeed our real sentiments are the same in the main — or may seem to differ more than they do, by using terms that are without a precisely fixed and determinate meaning — or to be wide in their sentiments from this doctrine, for want of a distinct understanding of it: whose hearts, at the same time, entirely agree with it, and if once it was clearly explained to their understandings, would immediately close with it, and embrace it. How far these things may be, I will not determine, but am fully persuaded that great allowances are to be made on these and such like accounts, in innumerable instances. Though it is manifest from what has been said, that the teaching and propagating contrary doctrines and schemes, is of a pernicious and fatal tendency. whew. pass me a towel, Jon, please? Hence (by the way) the love, honor, and obedience of Christ towards God, has infinite value, from the excellency and dignity of the person in whom these qualifications were inherent. The reason why we needed a person of infinite dignity to obey for us, was because of our infinite comparative meanness, who had disobeyed, whereby our disobedience was infinitely aggravated. We needed one, the worthiness of whose obedience might be answerable to the unworthiness of our disobedience, and therefore needed one who was as great and worthy as we were unworthy. I stumbled upon this discourse while looking for something to read, providentially just after I had finished Fuller’s Gospel & Law, and had my mind thoroughly exercised with Edward’s theology of “Justification by Faith Alone.” This was originally a set of sermons he preached which had resulted in a great response from his congregation, and at their insistence he had them published. 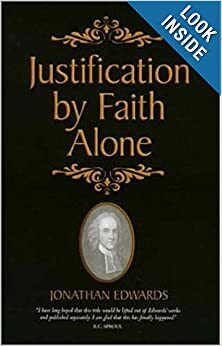 He first goes to his typical great lengths to define what he means, first by “Justification,” “Faith”, and “Alone.” He clears away misunderstanding when talking about faith: calling it a “condition” of justification may be true, but not very clear; calling it the “instrument” of justification is liable to misunderstanding. In the end, he defines it from a couple directions. 1.) Faith is “that which renders it a meet and suitable thing, in the sight of God, that the believer, rather than others, should have this purchased benefit assigned to him.” 2. )It is suitable because “it is that in him which, on his part, makes up the union between him and Christ.” We are not justified as a reward for the virtue and excellency that is in faith, and Edwards goes to great lengths to explain why this is so. Throughout the discourse, several related subjects are given thorough Edwardsian treatment, particularly as they relate to justifying faith. The infinite guilt of the sinner, how Paul’s reference to “the law” as distinct from faith cannot refer merely to the “ceremonial law,” and how the honor of the Mediator is at stake in this doctrine, are just a few. I had never thought about “the honor of the authority of God,” but Edwards has, and he explains how it relates to justifying faith. He gives an exposition of how “all our righteousnesses are as filthy rags,” how the saints will have differing degrees of glory in heaven, yet each as full as they can be, and all on the basis of Christ’s righteousness not our own. He defines repentance and its relation to faith, explains how hatred of sin flows from justifying faith, and concludes with a model of Christian charity in theological controversy, even when the stakes are as high as this. Throughout he is Christ exalting, concerned that Christ be glorified and magnified, and not an ounce of glory that He is due be withheld due to faulty doctrinal thinking. Once again, my mind has been lifted to new heights in reflection on the glory of God, the grace of God, the love of God, the beauty and the excellency of Christ. He explains that this light is given immediately to the soul by God, not mediated through other means, thought other means may accompany it. For instance, the word of God “conveys to our minds these doctrines; it is the cause of a notion of them in our heads, but not of the sense of their divine excellency in our hearts.” That sense of divine excellency is given immediately, directly from God Himself. He proves his points from scripture, and from reason, and then offers an “improvement” on the doctrine, aka “application.” 1. Reflect on the goodness of God! 2. Examine ourselves, and see “whether we have ever had this divine light let into our souls.” 3. Earnestly seek this spiritual light. Amen, and amen. I highly recommend this sermon as a meditation on the revelation of the beauty of truth to the soul by the Spirit of God. I am particularly sensitive to descriptions and analysis of false professions of faith, mainly because it was my own experience for 20 years of my life, and am also alert to its fearful possibility in others. I am always looking for ways to sift through the true and the false, as nearly as possible. When eternity is at stake, you must try to distinguish these things as closely as possible. Edwards, as usual, is so insightful. From A Divine and Supernatural Light by Jonathan Edwards, found in Banner of Truth vol. 2. It is not every affecting view that men have of the things of religion that is this spiritual and divine light. Men by mere principles of nature are capable of being affected with things that have a special relation to religion as well as other things. A person by mere nature, for instance, may be liable to be affected with the story of Jesus Christ, and the sufferings he underwent, as well as by any other tragical story: he may be the more affected with it from the interest he conceives mankind to have in it: yea, he may be affected with it without believing it; as well as a man may be affected with what he reads in a romance, or sees acted in a stage play. He may be affected with a lively and eloquent description of many pleasant things that attend the state of the blessed in heaven, as well as his imagination be entertained by a romantic description of the pleasantness of fairy land, or the like. And that common belief of the truth of the things of religion, that persons may have from education or otherwise, may help forward their affection. We read in Scripture of many that were greatly affected with things of a religious nature, who yet are there represented as wholly graceless, and many of them very ill men. A person therefore may have affecting views of the things of religion, and yet be very destitute of spiritual light. Flesh and blood may be the author of this: one man may give another an affecting view of divine things with but common assistance: but God alone can give a spiritual discovery of them. Curiosmith Publishers has some very attractive looking paperback editions of some Jonathan Edwards sermons, as well as many other authors. All of their product pages link to Amazon, and here is a page that lists all of their offerings so far. his reign on earth begun! Probably my favorite song from Joy Beyond the Sorrow, which might be my favorite Indelible Grace record yet. Merry Christmas, as we celebrate the coming of David’s Greater Son.